Now that interest rates are rock bottom, there is less risk to the counterparties, but it is still tribute, as companies must succumb to this swap if they want the loan. The swaps actually create a demand for pristine collateral, as I wrote on Seeking Alpha under my author name, Gary A, and that is the goal of the Fed and the banks, to create demand for US treasuries. That demand for collateral has the effect of keeping interest rates low. That demand protects the banks who take the low, floating side of the bet. Well, as the hashtag says, #interestrateswaps, it turns out that the tweets that are connected to this hashtag reveal that in the UK, companies are trying to get some relief from this swap scam that has seen their hedge blow up in their faces. The UK has ruled that companies have the ability to seek justice, but no such finding has been determined for Wall Street as of the writing of this article. The LIBOR scandal has brought this interest rate swaps scam to the public view, but the scam, in my opinion, is the swaps themselves, sold as inflation and interest rise protection when the central banks determined the direction of rates, oh, and the swaps themselves increased demand for the treasuries, further insuring low interest rates. It is like a circular game the banks are destined to win! Of course, like the MBS settlement in the US, it is unlikely that the UK barristers will succeed in getting full justice. This may trim bank profits a little bit. 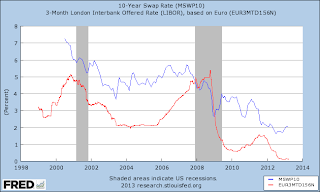 Berg: Do You Have a Dispute Over Mis-Sold Interest Rate Swaps? Clearly, the help for companies in the USA has been put on hold. Wall Street is even more intransigent than the Square Mile in the UK! Maybe we are poorer here. We do know that JP Morgan is the leader in this Swaps Market that makes the MBS market look like child's play. Our companies should get some sort of relief if the UK, the center of financial skulduggery can see that a huge injustice was done. But we know that the robosigning scandal gave 80 percent of the victims less than $1000 in the banking settlement. So if we are looking for justice in the USA as regarding banks, don't hold your collective breaths. You seem to be working overtime to attract attention to yourself. Not that you haven't learned enough to make legit points now and then but none of it is the kind of original thinking you want us to believe you're doing. BI seems to get you more troll results. And one more thing. The chart is mine. I gleened it from Fred. I don't claim to be a chart guy, but it is original. As far as originality is concerned, there are few that make the argument that interest rates will stay low and bonds will stay in demand. And many who do don't really understand why. Since I am not a banker I have to rely on my ability to see the important issues. If that is not original, that is ok. You know why? The issues need to be brought to the attention of people. The banksters were at fault for the original housing bubble. Is the idea original from me? NO. But I had a hunch that the bankers were at fault, not the GSEs, and I researched it out and came to the decision that they were at fault. 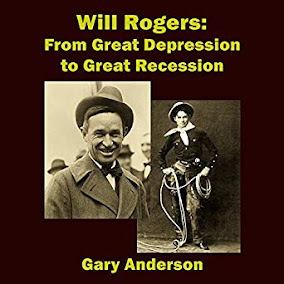 I have sold over 1000 ebooks Will Rogers, From Great Depression to Great Recession. I believe the idea to focus on Rogers when we had virtually the same thing was original. In Europe (not just the UK) banks are being taken to task for the mis-selling of OTC derivatives such as interest rate swaps to small businesses. Also many businesses are entering into litigation in order to seek full legal redress as some businesses do not qualify for the review and others consider legal redress will give greater levels of compensation. I appreciate Lexlaw Solicitors commenting on the subject. This is an attempt at some justice for businesses who have been gouged by swaps.